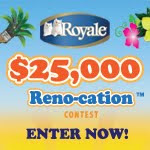 Back by popular demand is the Royale Reno-cation Contest with bigger, better and more prizes totaling $25,000. And to celebrate, I’m having a giveaway at the bottom of this post (read on for those details). An additional $5,000 in prizes will be given away to secondary winners in the form of 15 weekly prize packs from the Royale Luxury Bath Collection that include a personal heated towel rack, new luxurious towels, and premium Royale robes. As many of you know, we have bought a house and we move in mid-April. The house was built in 1986 and although it has had a lot of great updates, there is still a lot that can be done. So you better believe I’ve entered this contest. If I win, I think I’d use the $13,000 on a new kitchen. The kitchen is nice and functional, but it hasn’t been updated as much as the rest of the house has — or maybe new bathrooms, those are a little dated too. And now for our giveaway: Royale is generously offering one This Bird’s Day reader a ‘mini-cation’ of their own which includes a $50 Cara Restaurant gift card (Kelsey’s, Montana’s, etc) AND a $50 Home Hardware gift card as a giveaway. To enter: Leave a comment at the end of this post telling me what you would renovate and where you would like to go if you won the Royale ‘Reno-cation’ contest. Please leave a way of contacting you if you win. (You must complete this entry for any additional entries to count). you can enter this contest once per day for each day that you enter the Royale Reno-cation contest until this contest close date. This contest is open to Canada and runs until 12pm MST on Tuesday, April 27, 2010. I wrote this post while participating in a blog tour campaign by Mom Central on behalf of Royale. Comments are now closed for this giveaway – thank you to everyone who entered. reentered. WOuld do my kitchen and then go south to L. A. The reno money would go towards our upstairs addition and we would love to go on a vacation anywhere! I'd definately reno my basement for my teens, and as far as vacations….always wanted to go to Greece. I ENTERED THE ROYALE RENO-CATION CONTEST TODAY ! I entered the Royale Reno-cation contest today. I reenter daily. I would do my kitchen and then fly off to New Zealand or Los Angeles. entered the contest off site today. Our kitchen needs a renovation because the cabinets are so old and space is not used well. No better place than Hawaii to spend while it's being done! I entered again today! Our kitchen desperately needs a renovation, so we'd start there. While that's happenning, we'd go to Hawaii! I need a new deck and always wanted to see HAwaii! I would like to apply my good fortune to my daughters home as it has a lot of possibilities and she is in more need than I am. I reenter daily and would do my kitchen and thenis would be awesome to fly off to New Zealand. I entered the contest again today. Hopefully I'll be able to have our kitchen redone and spend the time in Hawaii! We would go to Hawaii and have our kitchen renovated! I entered again today. Good luck everyone! I would renovate our basement ,put a bathroom and make a family games room so everyone can enjoy each other's company. I would love to travel to Paris France and learn the French culture and history. Thank you for this give away. I WOULD BUILD A NEW DECK FOR MY WEATHER-WORN ONE AND THE GO TO HAWAII!! I RE Entered and would do my kitchen and then fly to New Zealand. I entered the contest today. I would totally redo my kitchen from top to bottom. entered the Roayle contest today. would love to go to Hawaii and need a new deck! I re entered and would do my kitchen. Then I would fly off anywhere as I would need a holiday. New Zealand or L. A. would be nice. I entered the royale contest today! We would redo our kitchen with new cabinets, sink and flooring. Why not spend the time in Hawaii? I entered again today. We would go to Hawaii and renovate the kitchen! I entered again today. Good luck everyone! I entered the Royale contest today. I would do a reno on my kitchen – new cupboards, granit or corian countertops, new floors. I entered again today. We would go to Hawaii while our kitchen was renovated! If we win, we're going to Hawaii and having the kitchen renovated! I'm entering again today! entered the Royale contest today. I re entered and would do my kichen and then go to New Zealand. I entered the contest today! I would definitely renovate our kitchen and spend the time in Hawaii with our new son. I entered again today! I entered again today… hopefully we will get our kitchen remodelled and go to Hawaii! My bathrooms would get a major workover – we need a nice sunken tub and a nice steam shower. Of course, hardwood floors would be nice, also! And a trip to Bermuda! We're adding a level to our house so are spending lots of money we don't have! That also means no vacation for us this year so would be great to have extra cash for the renos AND a vacations! We need to have a kitchen redone, so we'd love to win this renocation. Then we could go to Hawaii while it's being done! I entered again today. Hoping that I win, so we can redo our kitchen and spend the time in Hawaii! I need a new deck-cannot use the one i have now…and then go to Hawaii! All of the money would go to our already planed renos, that we can't afford! I re-entered. Would do my kitchen and then fly off to New Zealand. O.k. maybe just L.A.
We would take a trip to Hawaii while our kitchen was renovated. I just entered again today. I just entered again today. Hopefully we'll be able to renovate our kitchen and take a trip to Hawaii! I reentered and would do my kitchen and then go to New Zealand. I entered the contest again. Still hoping to win! I'd love to renovate my back patio and go to the Bahamas. We would go to Hawaii while our kitchen was renovated if we won. I entered again today! We would have our kitchen renovated and spend the time in Hawaii. I entered again to increase my chances! I would finish the renos already started upstairs! I re-entered and would do my kitchen and then fly off to NEw Zealand. I wish! I re-entered and would do my kitchen and then fly to New Zealand. I would take my husband and son to Hawaii while our kitchen is being renovated! Just entered today again! Our kitchen desperately needs a reno, and where better to spend the time than in Hawaii on a beach! I will enter again today and try to win! My daily entry with thanks!! I WOULD GO TO HAWAII AND BUILD A NEW DECK! Re-enter daily and would do my kitchen and then go to New Zealand. I entered the contest again. entered today….happy to see the matching game is back! I entered the royale renocation offsite today. entered the Royale sweepstakes today. A nice trip to Hawaii would be a nice distraction while our kitchen was renovated! I would renovate our kitchen and go to Hawaii! I will enter again today to increase my chance of winning! I reentered and would do my kitchen and then go to New Zealand . Daily entry and Thank You!! I would take a trip to Hawaii if I won! And while I was there, I'd have the kitchen renovated. I'm entering again today hoping I win! Entered again today. Hoping to renovate our kitchen and spend the time in Hawaii! I reentered . I would do my kitchen and then fly off to New Zealand. We would renovate our kitchen and spend that time in Hawaii on a nice beach! I'm entering again today! We would renovate our kitchen and go to Hawaii! I re-entered and would do my kitchen and then fly off anywhere but prefer New Zealand. I entered the royal renocation offsite today. I would definantly reno my kitchen with new flooring. I'd like to travel to Hawaii. I entered the Royale one today! I entered and I would do my kitchen and then fly off to New Zealand if I could. I would redo my bathroom as it really needs it – new floor, new shower stall, new windows, everything. I would go to Pennsylvania to visit family. entered the royale renocation offsite today. If I won the renovation I would like to help my parents finish the basement. Right now it's just a junk collector and I would like it to be a basement apartment. For the trip, I would like to go on the Alaskan Cruise however, if I won and could give the tickets away, I would give them to my parents who have been trying to go on that particular cruise since their 25th Wedding Anniversary… 7 years ago.. I have entered and would do my kitchen and then go to New Zealand or anywhere! I can't sleep and I'm entering in the wee hours of the morning. Our kitchen desperately needs to be made over to make better use of space and get rid of our ugly cabinets. While that's being done, I'll be in Hawaii if I win the contest! Entering again today! We would have our kitchen renovated and go to Hawaii! I'm entering again today in the hopes of winning! I WOULD GET A NEW DECK AND GO TO HAWAII! I entered and after I redo my kitchen I would fly off to New Zealand. I could really use the money for our renos … we're expanding up! New Game today on the Royale!! A nice Hawaiian vacation would be my choice of vacation and the reno would be our kitchen! I would renovate our kitchen while we spent the time lounging on a Hawaiian beach! I'll enter again today! I ENTERED AND I WOULD DO MY KITCHEN AND THEN FLY OFF TO NEW ZEALAND. Summer is around the corner and cannot use my deck because it is in such bad shape-would love a new deck and a trip to Hawaii! We would go on a Hawaiian cruise while our kitchen was made over. It's hideous with poor use of cupboard space! I will enter again today and hope I win! I would visit family in Saskatchewan & Manitoba and would love to have new floor covering in the living room. I entered and would do my kitchen before flying off to New Zealand. I can not use my deck because the wood has rotted and it is too dangerous-so ,needless to say, need a new one and would adore a trip to Hawaii! I would renovate the bedroom and onsuite and a trip to New Zealand. I just entered the royale contest again today. I would have our kitchen remodelled and spend the time in Hawaii! Entered again today. We'd go to Hawaii and have our kitchen redone! I WOULD LOVE TO GO TO HAWAII AND NEED A NEW DECK-BADLY! entered and played the game today. I found all the differences today in the Bonus entry. I played the spot the difference game today! I entered and would do my kitchen and then off to New Zealand – I wish! Entered the Royal Renocation contest today. We would go to Hawaii and relax on the beach while the kitchen is being renovated. I would take my wife and son to Hawaii while our kitchen is re-done! NEED A NEW PATIO AND WOULD ADORE A TRIP ANYWHERE–ESPECIALLY HAWAII! I entered the Royale Reno contest today. I would finish our basement. I would love to take my son to Disney World. I entered today and I would do my kitchen and then fly off to New Zealand! Yipee! I played and entered the Royale today. I entered the contest and I would do my kitchen and then off to New Zealand! entered the royale renocation off site today. I played the spot the difference game today to enter! and I would love an alaskan cruise! I would have our ugly kitchen renovated and spend the whole time in Hawaii on a beach or snorkelling! I would take a trip with my wife and new son to Hawaii and let our kitchen get remodelled. Another entry into the contest today! Cheers! Sheri: The kitchen is in need of reno pretty badly! I have 3 different sets of cupboards and hardly any cupboards. One set looks like something from the sixties…. I have put up cheap wallpaper and there is no backsplash. The small kitchen window is DRAFTY! …. Do I need to say more! It is too embarassing for company to come over and see the kitchen… The trip would be on a cruise to Bermuda and the Bahamas but I would rather see my son in Edmonton and the Armed Forces Base! Hope there is a tie for the win! Marg P.
I WOULD RENOVATE MY PATIO/DECK-IT HAS HOLES IN IT! AND THEN, GO TO HAWAII! I would take a cruise to Hawaii, visit some of the islands and lie on the beach… all while our kitchen is being renovated! I just entered the contest. I would go to Hawaii while our kitchen was renovated! I just entered the contest! I ENTERED RENO-CATION TODAY AND WOULD LOVE TO GO TO HAWAII AND NEED A NEW DECK-THAT'S ALL! I would renovate my bathroom which really needs it, and then go on a vacation to Vancouver! I would love finish our basement with a TV room with a wood stove, a laundry room, a gym and a storage room. I would renovate my kitchen and then go to New Zealand. I would re-do our bathroom! I WOULD GO TO HAWAII AND NEED A NEW DECK-ONE WITHOUT HOLES! I would renovate the family room – it is MUCH needed! And I would love to go somewhere warm warm WARM!! I can't remember if I already did my mandatory entry so just in case: I would re-do all the flooring in my house plus re-paint most rooms!! I entered the Reno-cation contest today! I entered the Royale contest today!! I entered the royal renocation contest today. I would take a cruise and then stay in Hawaii while our kitchen is remodelled! I would take a trip to Hawaii and redo our ugly kitchen! I entered the Royale Renocation promotion today! I ENTERED THE ROYALE RENO CONTEST TODAY, WOULD ADORE A TRIP TO HAWAII AND NEED A NEW DECK SO Much! I would finish our already started renovation and spend the summer on the east coast! Entered the royale renocation one today. I would take a trip to Hawaii and then have our kitchen renovated. I would go to Hawaii while we renovated our kitchen! I entered the Royale giveaway today! I entered the Royale contest. We have a new game!! I WOULD LOVE TO GO TO HAWAII AND NEED A NEW DECK REALLY BADLY! entered the royale renocation contest today. I entered the Royal contest today!! WOULD LOVE TO GO TO HAWAII OR ITALY AND NEED A NEW DECK! I entered the renocation contest! I entered the Royale giveaway today. I entered the Main contest today! I would put a new kitchen in our old family cottage! i entered the renocation contest today! I would get a kitchen reno with new granite countertops, new cupboards and a backsplash and for holiday i'd go on a caribbean cruise! Our kitchen needs to be redone badly. So that would be a good place to start, while we're sunning ourselves in Hawaii! I would renovate our kitchen and go to the Caribbean! I played the match up game again to enter the royale contest! I have played the game and entered the main contest today! I would start in the bathroom, then move on to the kitchen, and then the living room…(you get the idea!) And, I think while the work was going on you would be able to find me relaxing on an Alaskan cruise. My whole house needs an overhaul, I would start with my kitchen. Cruises are something I always wanted to take. I entered main contest again today! My daughter's bedroom needs some grown up touches, so does most of my house. Hardwood floors will help with new puppy. A trip anywhere warm, cruise. Would do bedroom and bathroom and if anything left over the livingroom and garden. Wouldn't that be fantastic. And to travel on top of that. Awesome! I entered the royale contest today, Mar. 20. It would be great to renovate our basement and I'd love a trip to the Caribbean, India anywhere!! need to renovate deck/patio and would adore a trip anywhere especially Hawaii! My kitchen is definately in need of an overhaul. Counters, flooring an island, new lighintng. It would be nice to include my discussions of renovations with my friends as they share their own stories. I also entered the royale reno-cation contest today! I would renovate my kitchen and get rid of the cheap ugly cupboards. If I won the Royale reno-cation contest I would choose Turks & Caicos to vacation! I think Hawaii would be a great place to go while the kitchen is redone! I would reno our kitchen and go to St Maarten! I entered the royale renocation contest today. I entered the royale contest today, mar. 19. I would repaint our bedroom ans add closet organizers. I would love to travel to Cuba but with this win I would go to Montana's and let me eat steak!! I entered theRoyale renocation contest today! If I won I would love to renovate my kitchen. I would get granite counter tops, new fridge, stove and dishwasher. I would also love to put closet organizers in all the closets, as well as paint. For a vacation I would love to go to Israel because my husband has never been there and it is a beautiful country. need to renovate my deck-it has holes in it! and would love to go to Hawaii! I would love to renovate my spare bedroom so that my baby boy can have his own room. It needs some furniture. For a vacation, I would love to go to Italy. I entered Royale Renocation contest today. I entered the Reno-cation contest. I would redo my kithen and possibly my laundry room! LOL . And I would wisk my son away to Disney!!! So many things need to fixed up in our home and i am not sure which i would do at this moment. I know our bathroom and kitchen could both be fixed up as bathroom ceiling is chipping and tile floor in kitchen is breaking. Also for a vacation i would enjoy going on a family cruise as i hear they have great programs even for the kids. It would be so nice. I would renovate our unfinished basement in our new home. Eventually we would like to have a Rec Room, Second Bathroom, Bedroom, Office and Storage Room in our Basment. This Renovation Prize would be Great. I entered the Royale Reno-cation contest today! I'd remove all the carpet from the main floor and replace it with eco-friendly bamboo. For a trip, I think we'd head to the coast of California. I entered the Royale contest today, Mar.18. I entered the main contest. I would get rid of our worn out and stained carpet, finish painting the rest of the house, and put in a/c! I'd love to go to the Carribean or an Alaskan cruise. I'd renovate our main bathroom and travel to Peru or Argentina! I think I'd redo my bathrooms… I hate them! The people who lived here before me did such a terrible job. I think they closed their eyes, spun around, and threw grout and tiles randomly! As to where I'd go, my favourite place on earth is Niagara Falls. My very first "grown-up" vacation, planed by myself, was to Niagara, so it holds a special place in my heart. entered the contest today as well! I would redo my living room with hardwood flooring and re-paint the walls. I'd love to go to Italy! I entered the royale contest today as well! I would change the carpet in my kids room for sure! I entered the Royale contest today! Only took me 11 tries to match up today. I entered the Royale Renocation contest today! I would renovate my recreation room just before I headed to the Caribbean. I would put hardwood flooring in my bedroom and get rid of the carpet. I would love to visit my sister-in-law in Australia! I played and entered the Royale Reno-cation today, mar. 17. I've been entering the Royal Renocation contest since it started ! But I will let u know every day :) I entered today by the way. My renocation would be a complete redo of the current 80s kitchen partical board with oak accent kitchen we have now. Its barftastic makes you want to listen to 80s music and make some kraf dinner cuz thats what I loved in the 80s? hah Then I would escape the blast from the past kitchen to Jamaica and come home to my futuristic contemporary oasis! What to choose?! We've only been in this house a year and need to do SO much! First though we have to think green so I would get new windows and a tankless water heater! I entered the Royale main contest today and everyday since it started. I would like to put in a sit down shower for medical reasons, would make life alot easier. I really want to replace the front door and the garge doors. I am thinking of painting them orange to go with our brick work. Trip – I am interested in Iceland or Egypt. I would scrap the deck i have now-it is totally falling apart and make a brand new patio area. I always wanted to go to Hawaii! I would renovate our kitchen-the floor is in rough shape. For the trip I would love to go to Hawaii. I entered the Royale Renocation contest as well. I would paint the kitchen and bathroom etc. and then go to Hawaii to relax. I would renovate my kitchen. For the trip i would choose to tour italy. Then I would go on a cruise to the Caribbean!! I entered the R0yale contest today! With my win I would redo all my floors(except the bathroom) on the main level and put in hardwood. I'd love a cruise around Hawaii! I would get granite countertops in our kitchen as well as new light fixtures. The chandalier we have in our front hall is hideous. If I won a trip, I would love to travel to Europe and explore Italy, Czech Republic and Greece. I would renovate our garage, it need new windows and doors and the roof resurfaced. If I won the trip I would visit Arizona and Utah & perhaps California. I would renovate my bathroom. It needs updating so badly. Vacation: Hmmmm….Alaskan cruise has been on my wish list for a while. I would love to renovate my kitchen — it really needs help — I have mint green counters and appliances that are about 20 years old!!! I would love to go to somewhere tropical with the kids. I'd replace the upstairs carpet and then cruise around the Caribbean. I would renovate my basement, make it a friendly place to watch tv and chat with friends and family. I would like to renovate my recreation room. I'm in the process of renovating my dining room, this would definitely come in handy! My main bath needs to be renovated to accommodate a wheelchair. I've been considering a river cruise through Russia. I would love to be able to finish working on my kitchen–it has sat undone for the last six years. This area of the house has a low priority for hubby. As for a cruise, I would choose to go to the Amalfi coast line of Italy. I entered the Royale contest today, mar. 16. Our bathtub is getting pretty icky, no amount of caulking seems to help so a new bath tub would be first on the list if I won and new carpeting for the living room (senior dog). I have never cruised before but would love a European cruise with stops in different countries so I could see the world. I would repaint my condo and redo my kitchen with the reno – for the trip – I'd go anywhere hot! My Reno-cation would consist of a kitchen makeover (move my very inconvenient galley-style kitchen to the other end of the kitchen area and put in new cupboards, countertops and appliances…oh yeah, and a new floor!) I realize I will probably have to add some of my own hard-earned $$ to get what I want, but what a great start to having my dream kitchen! As for the cruise, I would love to visit Grand Turk, Caicos Islands as part of my cruise! I'd get hardwood floors upstairs, granite counters in the kitchen and new light fixtures! And I'd go to Italy. I've always wanted to go there.